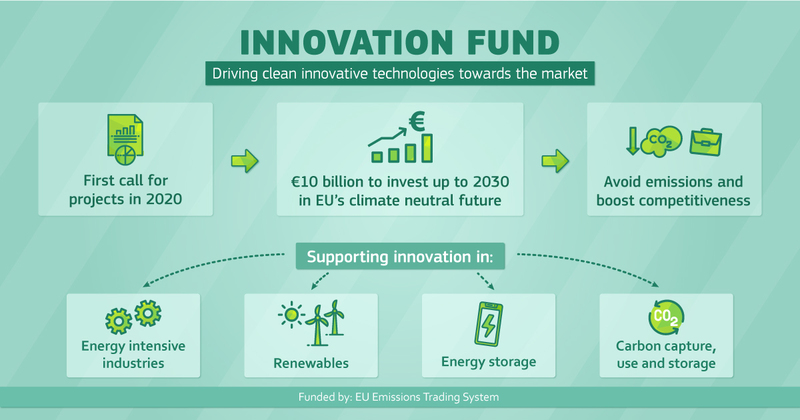 26 February, Brussels - The European Commission has published details of a €10 billion fund to support companies and public authorities investing in the next generation of low carbon technologies. The Innovation Fund aims to reduce the risk for largescale flagship projects that result in significant emission reductions. Highly innovative technologies in four sectors are eligible for funding: energy intensive industries, carbon capture use and storage, renewables and energy storage. The fund is financed by the EU Emission Trading System, and will replace the NER 300 programme. Projects can receive support equal to 60% of the capital and operational costs linked to innovation. As well as grand projects – the limit is above the €300 million maximum grant size in NER 300 – small-scale projects below €7.5 millions are also eligible. The Fund aims to complement the current EU funding infrastructure. It is expected to help the commercialisation of innovations developed in Horizon 2020 and Horizon Europe. The Innovation Fund can be combined with European Regional Development funding or InvestEU guarantees or equity contributions to help realise a project. The Commission plans to launch the first call for proposals in 2020, followed by regular calls until 2030. Further details and specific information will be provided in the Commission decisions launching the calls for proposals. Find out more on the Innovation Fund website.